SWANAND KIRKIRE SAYS ‘AAL IZZ WELL’!! A man of many arts, Swanand Kirkire is lyricist, writer, singer and actor. 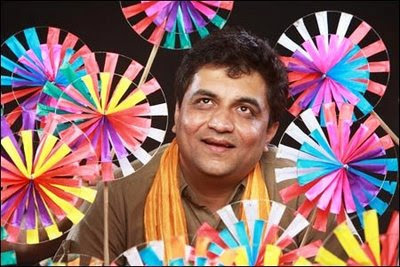 He is behind the freshly delightful song lyrics of Vidhu Vinod Chopra's upcoming release, 3 IDIOTS, starring Aamir Khan, Madhavan and Sharman Joshi. He graciously agreed to tell us more about the songs that are currently winning hearts among film and music buffs across India. AC: Random question, so what is playing in your Ipod right now? SK: I am not listening to the 3 Idiots soundtrack obviously because when I was listening to it nobody else was listening to it (laughs). Now the world is listening to it and I am listening to something else like lots of Indian classical music… I am also learning to listen to a lot of Western classical music. Apart from that, my all time favorites are R.D. Burman, Gulzar sahab songs, and that kind of music is well, like… my food! AC: You have repeatedly worked with Shantanu Moitra and Rajkumar Hirani. Please tell us a bit about what makes you feel comfortable working with them and how you came to be a team. SK: The association with Shantanu and Raju (Rajkumar Hirani) is old now, with Vinu Vinod Chopra too, for that matter. We really go a long way. I've done four films with them. This is my second film with Raju and my fourth with Vinod Chopra. If you see our filmography, it is me and Shantanu. Lage Raho Munna Bhai we did it with Raju. We are mostly friends, we're likeminded, we like each other's space… and unlike all the Bollywood "whatever happens" (philosophy) we were involved in this film right from the script level. When (Raju) was writing the script, we were making songs, we were trying to find the sound of the film. So that is how 'Give Me Some Sunshine' came much before he started writing the script. Raju wanted something exclusively for that film and if you listen, all the songs are very musically and lyrically simple. We did not try to make them complicated at all, we wanted to keep them very college like, easy for any college student, just as they play guitar at college and come up with some tunes. AC: What would you say each of the singers apart from yourself have brought to the 3 Idiots soundtrack? SK: All are wonderful singers! They brought a lot of things to the soundtrack. See the song 'Jaane Nahin Denge', no one else but Sonu can sing it, no one else. It is a very high and low song, the amount of passion reaches that high and then comes really down also at the same time. Shreya is also an awesome and fantastic singer. Shaan… well I mean their contribution is amazing and takes everything beyond. For a lyricist like me, the biggest moment is to hear (them sing), because we write a song on pen and paper, the music composer sings it with you and a guitar, then it goes to a recording… but the final moment when the singer is singing… that's a magic moment because the singer is transforming (the song) into something else, into a piece of art that becomes complete at that point of time. Sonu and all, they really made me cry. AC: How would you say the experience of making this soundtrack is fundamentally different from your past soundtracks? SK: It is very different. If you listen to 'Parineeta' the words are a little more lyrical and Lage Raho Munna Bhai was more Bombay tapori. In 'Khoya Khoya Chand' I was doing much more Urdu poetry because (the movie) was about the 50s or 60s Hindi film industry. That is something that I am trying to achieve in my life: you should change your clothes according to the film or the script. '3 Idiots' songs are very casual and are straight from the heart. There is no ornamentation or poetic smartness. In them if you have to say something you say it, it does not matter if you say it in English, Marathi or whatever. The songs get the point straight with as minimum possible and there is no concern about the language. There is not much decorative poetry but there are philosophy lines in it. 'Aal izz well' is a philosophy. AC: How did you come up with the 'Aal Izz Well' theme for the title song? Was its fun spelling already a part of the script? SK: 'Aal izz well' was in the script. It is a big idea of the film itself. Aamir (Khan) says it to everybody, whenever you are going through a bad time… Basically, Raju as a child used to live in a smaller town and there used to be this colonial watchman who used to say 'Aaaaal izzzz well!' in the night. So what used to happen is kids would think 'if all is well, let's go to sleep', and everything was well, you know (laughs). So that is the theory of the film. Whenever you are in a bad time, just tell your heart that 'aal izz well'. It is written as the colloquial pronunciation (proceeds to tutor the foreign interviewer into how to pronounce it properly). Aal izz well! AC: We know Sharman Joshi's voice is used in 'Give me some Sunshine'. Did the director, producer and/or actors contribute to the soundtrack? How? SK: The best part about working with Rajkumar Hirani, Vidhu Vinod Chopra and everybody is that it is a team effort. We decide on the songs and lyrics. There were contributions from here and there all the time. In 'Give me some sunshine', Shantanu almost wrote all the English part. AC: Tell us a bit about Sonu's interpretation of your lyrics in "Jaane Nahin Denge". SK: He is really amazing and he did a great a job. He understood the particular situation in the film and he heard it once and said 'I need some time to prepare'. He took his own time, about half an hour or 45 minutes, locked himself in a dark studio room and asked all of us to go out and then he came in and he sang. Sonu is always like that, he is technically the best singer we've ever had. AC: Was there any personal experience that inspired you to write 'Behti Hawa Sa Tha Woh'? SK: It came very naturally when they told me the situation (in the film). There are people in your life who live life really beautifully and happily. They do not compromise at any level and just do whatever their heart says is right. They don't follow stupid norms. So I had some people like those in my mind and actually it came very easily to me because I was comparing myself with them. Because of them I became another idiot (laughs). AC: Are there any new soundtracks in the pipeline? SK: The 'Paa' soundtrack has released. That was another kind of experience, different songs completely. It is on the market and on the Internet and the film is releasing on the 3rd of December. There are also two or three other films but it is early to talk about them now. Thanks to Mr. Kirkire and thanks to Aline! Yesterday Cinema Hindi website celebrated its first birthday with this WONDERFUL interview!!!! And sure: AAL IZZ WELL!